Dhamma Makaranda is located on the edge of the small village of San Bartolo, between Toluca and Valle de Bravo, on the highway via Amanalco. Valle de Bravo is a charming colonial town, with white stucco houses adorned with wrought iron balconies and red-tiled roofs. Located on the shores of a lake and surrounded by pine trees and mountains, Valle is just over an hour from Toluca. From the International Airport in Mexico City: Follow the signs to the bus departure area from the airport arrival area, or ask a porter to take you to the bus to Toluca. Buses to Toluca depart the airport every hour. Bus tickets are purchased at a booth in the concourse leading to the bus departure area. The trip from the airport to Toluca takes just over one hour. At the bus station in Toluca, you’ll change to another bus to Valle de Bravo. There are two bus routes to Valle de Bravo. If you arrive early and wish to overnight in Valle de Bravo, take any bus there. However, if you wish to go directly to Dhamma Makaranda, take the bus that goes to Valle de Bravo via “Amanalco” and “San Bartolo”. The trip from Toluca to San Bartolo takes over an hour, depending on traffic and the number of stops. After passing through Amanalco, the bus will reach San Bartolo, a very small village, in five to ten minutes. At about kilometer 46, you’ll come to a very obvious tope (speed bump). On your left will be a small shop: Imprenta para Bodas y XV años. Just beyond is a road sign that says: “Poblado próximo” (village ahead). SAN BARTOLO : At Km 52 you’ll come to the village of San Bartolo. Continue about 800 meters and on the left you’ll see a small Tlapalería shop. The sign that says “Vipassana” will be close to this shop. ROAD TO THE CENTER : Take the dirt road to the left, past the shop, and up the hill. When you reach the first “Y” — go left. Continue a short distance to the next “Y” — go right — uphill about one kilometer to Dhamma Makaranda (locally known as “La Finca”). It takes 10 minutes to walk to the Center. If you have too much luggage to carry, wait beside the highway and flag down a passing taxi to take you up to the Center. Taxis pass by frequently. To avoid arriving late, allow 4 hours for the entire trip from the airport in Mexico City to Toluca and on to Dhamma Makaranda. To reach Dhamma Makaranda by direct bus from Mexico City, take a taxi or subway (“Metro”) to the “Terminal Observatorio” bus station. Buses leave this terminal for Valle de Bravo every hour, starting at 6:00 am. Be sure to get the bus that passes through Amanalco. The bus from Terminal Observatorio also passes through Toluca. It will pick up passengers there and continue on to Valle de Bravo. The trip from Mexico City to San Bartolo will take 2.5 to 3 hours. Once you reach San Bartolo, continue following the directions given above. FROM VALLE DE BRAVO : If you are in the town of Valle de Bravo (if you spent the night or took the wrong bus), take a local bus (45 minutes) or a taxi (20 minutes) to San Bartolo. If you are on the bus, get off just as you reach the first houses in San Bartolo. Again, watch for the electrical towers. The road to the Center will be on your right. The taxi will take you up to the center, but you’ll have to give the driver instructions. 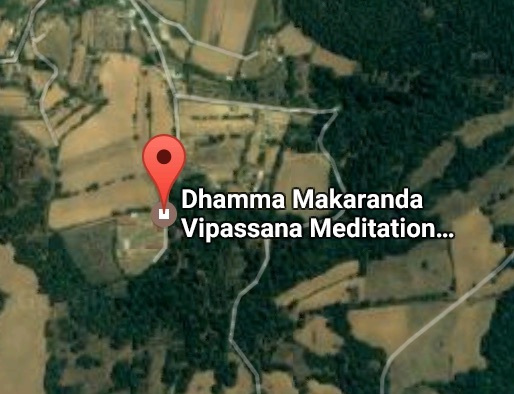 Follow the instructions given above to reach Dhamma Makaranda. May all beings be happy !